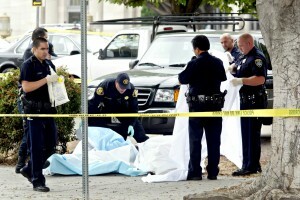 The murder convictions of two men who killed Oakland Post editor Chauncey Bailey were hailed Thursday by press-freedom groups and residents of the city for which Bailey reported. Bailey, 57, was the first journalist killed over a domestic story in the United States since 1976, and his death sparked a coalition of local media to join together in what later became known as The Chauncey Bailey Project to investigate the death and the police handling of it. The verdicts were praised throughout the city, as well. Father Jay Matthews of St. Benedict’s Catholic Church in Oakland was Bailey’s pastor and friend, and said he spent the day of Bailey’s murder at the Oakland Post’s offices trying to console the editor’s colleagues and friends. Oakland resident Melvin Hicks, 60, on Thursday was passing by the spot on 14th and Alice streets at which Bailey was gunned down as he walked to work on the morning of Aug. 2, 2007. “He got what he deserved,” Hicks said of former Your Black Muslim Bakery leader Yusuf Bey IV, convicted of first-degree murder and facing a mandatory sentence of life in prison without possibility of parole for ordering Bailey and two other men — Odell Roberson and Michael Wills — killed in summer 2007. Oakland Mayor Jean Quan and Councilman Larry Reid declined to comment; Oakland Police spokeswoman Holly Joshi said Chief Anthony Batts wouldn’t say anything either. “The City Attorney has advised us to refrain from commenting on the case as there is a pending civil lawsuit,” Sue Piper, Quan’s spokeswoman, said via email. Oakland Police Sgt. Derwin Longmire has a federal lawsuit pending against the city and police officials, claiming they ruined his reputation by leaking information about an internal investigation of his handling of the Bailey case. Longmire had been the lead homicide investigator on the case and came under criticism for allowing Bey IV and Bailey’s killer, Devaunghndre Broussard, to speak privately following their Aug. 3, 2007, arrest. After the private meeting, Broussard told investigators he acted alone when he shot Bailey; he later recanted and said he shot the journalist on Bey IV’s order. “This was a long and arduous process. The police investigation involved a number of irregularities, several of which were brought to light by the Chauncey Bailey Project, and his colleagues deserve credit for the success of today’s verdict,” Smyth said. What might once have been an organization of value to Oakland — Your Black Muslim Bakery — became nothing more than a street gang engaged in random acts of violence, O’Malley said. She noted that Bey IV still faces charges in the kidnapping and torture of two women from which he allegedly hoped to extort money. “In his extreme arrogance, Bey believed he was above the law — until now,” she said. Krum said she started feeling confident of a conviction last week, when the jury’s questions indicated they had already reached a verdict in Bailey’s murder and had turned their attention to the Wills and Roberson slayings. Josh Richman may be reached at jrichman@bayareanewsgroup.com; Kristin J. Bender can be reached a kbender@bayareanewsgroup.com; Angela Woodall can be reached at awoodall@bayareanewsgroup.com.